Doug VanDoren finishing a roll with his BBK Graflite. Many choices are available today in Greenland style paddles. Why would kayakers spend $200-$400 or more on a paddle when one can be whittled from an inexpensive 2x4? BBK paddles are the product of over two decades of full-time design, construction and testing Greenland style paddles. Our epoxy-laminated wood construction gives a better strength-to-weight ratio than monolithic paddles. We use heavier wood in the area that need most strength of impact resistance, and lighter woods where reducing weight is important. Laminating several pieces of wood together minimizes the chance of a hidden flaw in the material causing a weakness in the paddle. We add substantial strength by using unidirectional carbon fiber reinforcement in the lamination of the paddle, where the wood acts as a core to best utilize the carbon's extreme tensile modulus. All this sophisticated construction would be wasted if the paddle were constantly getting wet and subject to decay, or if paddlers got slivers in their hands as the wet wood swelled. That's why we apply multiple coats of epoxy and top if off with an extremely tough catalyzed acrylic urethane clear finish. Varnishes and oil finishes have very little moisture exclusion effectiveness, so they only slightly delay the onset of the inevitable degradation of wood exposed to water. Oils or varnish make a paddle look good in the store, and at a relatively low cost to the manufacturer. It would fit the hand comfortably, without fatigue, for hours on end. It would provide positive indexing by feel so that the exact position of the blades was intuitive. The blades would be shaped to provide maximum forward thrust with the simplest, most ergonomic technique, while simultaneously providing maximum lift on sweeps, sculls, rudders and braces. It would be strong enough to brace and roll with in the most dire circumstances, yet light enough to use all day. On top of this, it would utilize the best materials for a combination of durability and esthetic pleasure. BBK paddles have been painstakingly refined over many years to fulfill these requirement. 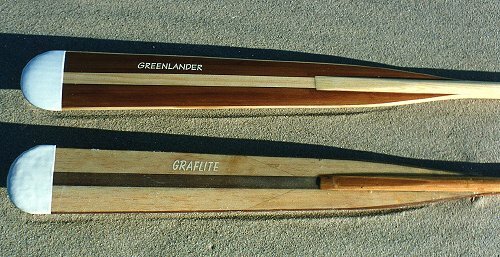 Replica monolithic (carved from a single piece of wood) Greenland paddles represent high design refinement, given the limited materials available to the Inuit. Twenty-first century materials allow us to take that design to the next level for the serious modern recreational paddler. There has been some misunderstanding about the anthropometric measuring system used by the Eskimo when it comes to sizing modern Greenland touring paddles. Many paddlers believe that their Greenland style paddle must be exactly X number of cubits plus so many fingers long, or the length of one's standing reach, or whatever. This is the system the Inuit used to determine paddle length. It is also the same system they used to determine the dimensions of the kayak. As it turns out, the paddle length is determined more by the size and shape of the kayak rather than the paddler. In a system where both were built to the same standard (the paddler's body measurements) this relationship between paddle and kayak would always be maintained. Today, when we build a limited variety of kayak sizes, a limited variety of paddle sizes serves quite well. Given that the Inuit were traditionally a short, stocky people with relatively short extremities (a very favorable physique for life in the arctic), applying their anthropometric standards to a European, African or Asian physique could very well result in some odd spatial relationships. Our experience has demonstrated that a tall, long-legged, long-armed paddler can actually more comfortably use a shorter paddle in a given size of Greenland style kayak than a shorter paddler using the same kayak. Thus, not only does the anthropometric system not really apply to modern paddlers, but its application to individuals of non-Inuit physique can result in dramatic misfit of paddle to kayak. Paddle needs will vary based on physique and actual combined beam/deck height, seat height combinations. For paddle repair and refinishing, please see the Paddles section of our Price List & Policies page. Recommend for 'Greenland style' kayaks with narrow beam (less than 23'') and low decks (less than 12''). Higher hung seats may necessitate longer paddles. 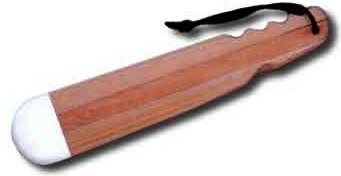 A small hand-paddle based on the shape of the Inuit atatl (spear throwing stick), which could be used for rolling if the paddle was lost in a capsize. It is an excellent tool for learning the Greenland hand roll. Rolling sticks are made from recycled wood whenever possible. Some are single piece, some are laminated, so appearance may vary slightly. All are epoxy coated, finished like our paddles, and include a nylon wrist cord.